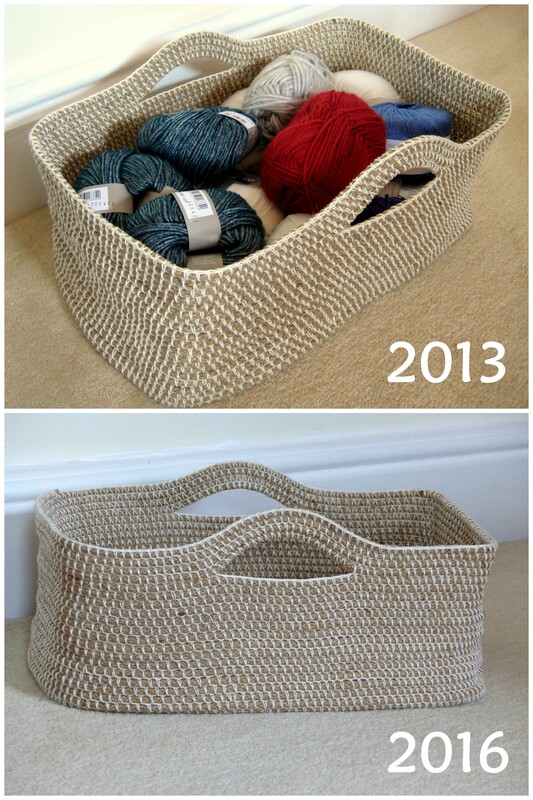 When I first made this crochet rope basket back in June 2013 I really wasn’t expecting to get much of reaction. To me it was just something I made for a specific space and use. However, it turns out that people like baskets a lot more than I thought – this is easily my most viewed project, and it inspired me to follow it up with Diamond Trellis and its successors (Diamond Trellis Rectangular and Honeycomb Pop). When I first published the post on how to make a basket by crocheting over rope, one of the questions I got people asking was how well it would last. Given that it was newly made I couldn’t really say! So now we are nearly 3 years down the line I thought I’d write a follow up with recent pictures, because as you can see we are still making use of the original. It gets light but daily use holding my husband’s socks – an unglamourous job but something had to fulfil this task! So obviously if you use the principle to make a cat/dog basket (as many of you seem to have done, judging by the Ravelry project page) then I don’t suppose it will last quite as well as this. To me the basket feels less stiff, and principally I think this is because the rope and cotton have both softened and stretched a little. I do periodically (as in every few months when I can be bothered) pull it back into its original shape as the bottom of the sides can sag out a little. Also, some of the places where the rope is patched together from one length to the next are showing – but still reasonably secure. So I’m expecting this to last another few years at least! If you’ve made this project then please let me know how yours has held up – particularly if you used quite a different rope or yarn. Not bad at all for three years! I’m finding that most of the things I crochet for myself hold up better than stuff you buy in the store. I have a sun hat that I crocheted about 3 or 4 years ago, and it still looks new even though I wear it all summer long. It’s good to be your own quality control. Sometimes it’s as simple as weaving in the ends properly that makes things last longer! Still looks good as new! Great creation! I don’t think mine ever had the super-stiff sides yours had, maybe because I used sash cord? The sides now don’t stand up very well on their own, but I still like my basket. 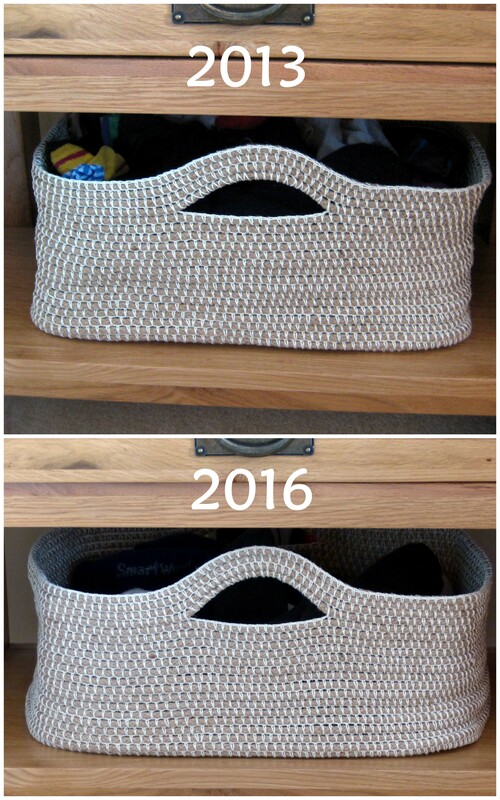 Your basket seems to have held up very well for being 3 years old. Now, 3 years later, do you wish you had done anything differently? Maybe dipped the rope ends in melted beeswax or treated them some other way? Or anything else? Love this basket. I have a hard time with written instructions and need a video. Do you have any videos that show step by step how to make a rectangular basket? I would really like to make the trellis design. Hope you can help. I made this basket, and my sides are not holding up. I wonder what I did wrong. Hi Donna! Sorry yours isn’t coming out so well. There is a knack to this technique. 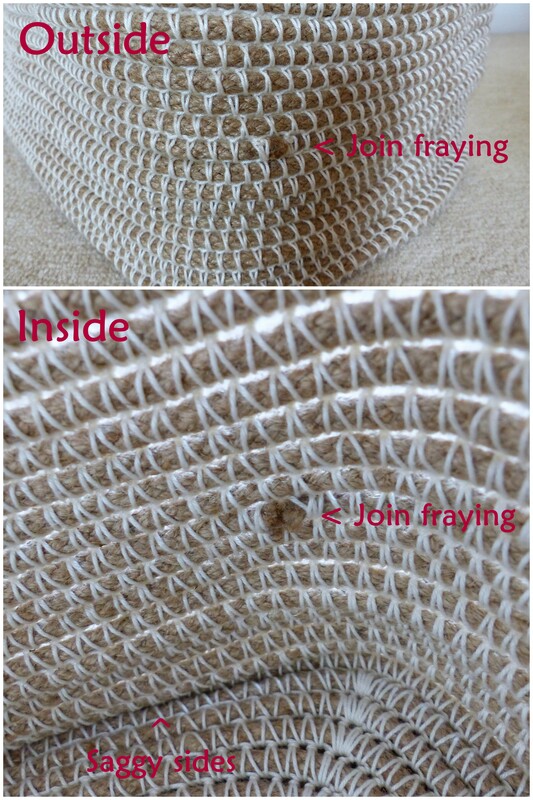 You have to use as tight a tension as you possibly can, and a non stretchy yarn (ideally cotton). Also I would recommend exaggerating the rope placement, e.g. if yours is sagging outwards, place it a little more towards the inside than vertical before crocheting over it. You can also try using a thicker rope. Hope that helps! I am doing the basket but smaller.Did redo a lot to tighten up tension.It helped but still don’t have square corners? Ho JoAnn! The corners will always be a bit curved as it depends on the stiffness of your rope – the stiffer it is the rounder the corner but also the more sturdy the basket. Sounds like you are doing all the right things so if you aren’t happy with it then maybe try a different combo of rope and yarn/thread. Hope that helps! Do you have a PDF of the pattern? Trying to cut down on the amount I’m printing but I do love to print and share with my daughters. Hi Mary Anne! Sorry no pdf because it’s more of a set of instructions than a pattern. Hope you enjoy making it though! Can you share the brand and type of rope you’re using? I’m using Bonnie craft yarn for my basket and it’s turning out more flexible than I would prefer. Thank you for sharing this basket idea!! Hi Rachel! Sorry but I really can’t remember (if it was even branded) as it was so long ago. It’s just a bog standard sash window cord from my local b&q (a hardware store here in the UK).